This is my cottage. Well, not exactly. You see, my family built it when I was little. My Pépère and my dad both owned their own construction companies, one of my uncles was an electrician, and my other uncle was good with tools. The ladies of the house, my Nanny, mom and aunts, were equally helpful in their own way. As for my cousins and I, I’m sure we were more of a hindrance than a help, but I do remember being in charge of picking up debris and bringing tools. My grandparents owned this cottage until I was in my early teens. Though I don’t own this cottage, and neither does my family anymore, I help build it. It still feels like mine, perhaps because the memories are so vivid in my mind. I can’t remember the cottage not being there, but I know I was there first, before the foundation was poured. I was little. My first memory of this cottage is when we would go up for the weekend to work on it and have to go up the ladder instead of the stairs when it was time for bed. But my parents remind me of the time where we would go there and have to camp because the cottage didn’t have a roof yet. Eventually the railing and stairs were built. That’s when the wallpaper when up. It remains up to this day. Once the cottage was finally complete, we would drive up to the cottage after school on Friday (heck, sometimes I would get to skip school and drive up with my Nanny and Pépère!) and play until it was time to go on Sunday. We would often stop for fries and ice cream on the way there and back. My cottage, the best place on earth. Not that biking on those cottage gravel roads was a good idea. I suffered a pretty bad fall when I finally graduated from the training wheels. My cousins and I were out biking without adult supervision (one of my cousins was old enough to supervise) and my front tire started to go crazy while going down a big hill. I wasn’t strong enough to correct it and crashed real hard. I have never seen those boys bike so fast in their lives. One stayed behind with me while the other raced back to the cottage for help. They weren’t always so thoughtful though, once they thought it would be fun to throw sand in my eyes. Apparently it was meant to be “fireworks!”. Hours and hours of torture while my mom flushed out my eyes and fished out the granules. Boys will be boys. It was where I got to get crafty. 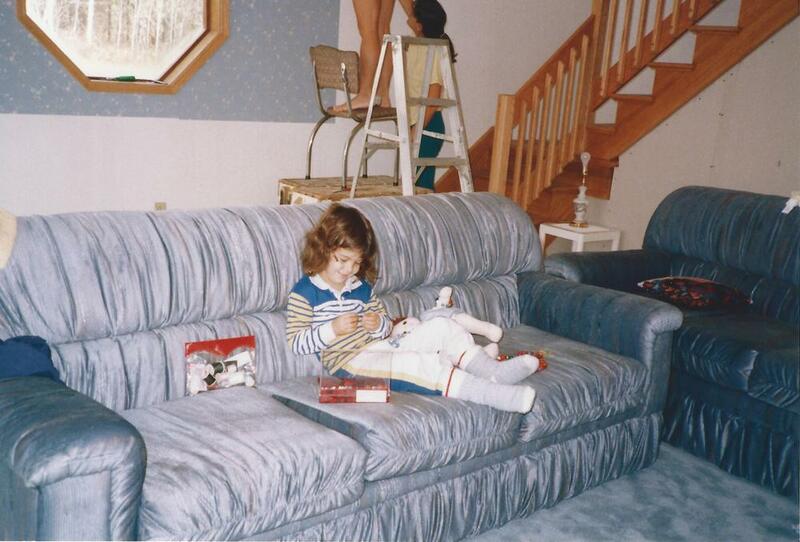 When it was time to get away from the boys, I would sit and sew or embroider alone or with my mom, aunts, on my Nanny. Sometimes, I was forced to untangle yarn when my mom or Nanny were in the midst of knitting sweaters. It wasn’t all playing pretend. Sometimes I got to help the ladies of the family make jam and pickles. Again, I’m not sure I was helpful but they let me pretend I was. In town I was more of a caged animal. I didn’t have many friends in school so I never enjoyed going out to play for recess so I often hid in a corner to read or make friendship bracelets (I really don’t know who I gave them to seeing as I had so few friends). At the cottage, I was a completely free range animal. I spent my days in my bathing suit so that I could jump in the water at any time, run around on the beach, bike to the end of the street to pick golf balls and sell them back to the golfers (apparently that’s illegal but the golf course let cute kids do it), play on the monkey bars and rings, go boating, tubing, kneeboarding, and four wheeling. Ever since the cottage was sold I’ve longed to return. Return to the place I call home. Return to nature. Return to monkey around. Most of all, return to entertain in that fabulous dining space. To sit at the table my dad crafted and look out at the water while enjoying a delicious meal amongst terrific company. My dream is about to come true. I would like to invite you to join me Friday August 7 to Sunday August 9, 2015, for an unforgettable weekend yoga retreat. The Yoga by the Lake retreat will be my opportunity to share with you this beautiful space along with great food and nurturing yoga classes.